When it comes to baseball, you mean business. Add a sporting touch to your office wear with this silk tie. Please note: no choice of stadium available, actual stadiums that appear on each tie will vary from photo shown. Great gift for baseball lovers! Great quality and it will match most suits, super cool gift! I was not happy with the packaging. It was difficult to open. My dad loves baseball, and the dark color and sleekness of the pattern makes this professional enough for him to wear into work without screaming "this is a baseball necktie". It arrives in a very strange thin cardboard package, however, that if you cut too far away from the tie itself doesn't actually open the package but because the tie is thin it's hard to tell if you are cutting into it or not, so opening it is a real risky procedure. Arrived in a timely fashion and was better quality than expected. Very nice. 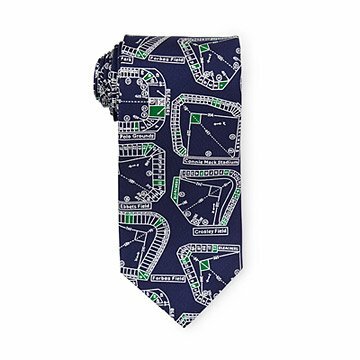 My son-in-law has plans to visit all the major league parks....now I realize these are old parks...some long gone....but he can study them and show the tie off at work. As a conversation piece at social events. Grandson's smile! I'd buy it again! Grandson is excited about wearing to special baseball related events. He has thanked me twice - what else does a Grandma need! Love it! good quality. Prompt delivery.